If you have three vehicles but only a two car garage, what do you do with the other car? Off-site storage is one option, but it’s not ideal, especially since you want convenient access to your sports car or rarely used vintage automobile. Leaving a car on the driveway makes it vulnerable to theft, vandalism and the elements. 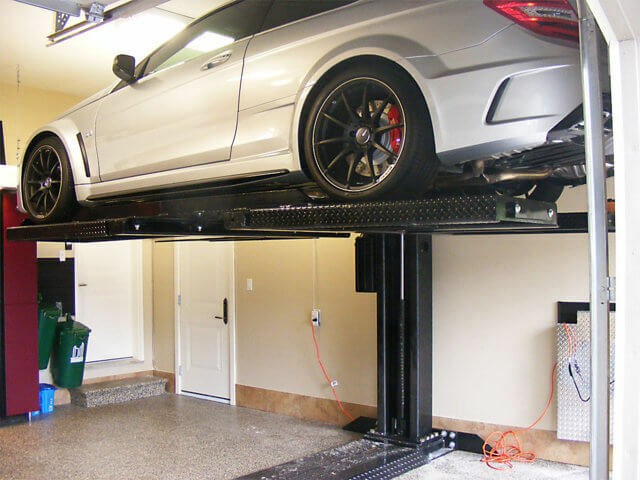 A hydraulic lift can double the number of cars you’re able to store in your garage. Start by first figuring out if this option will work for you. 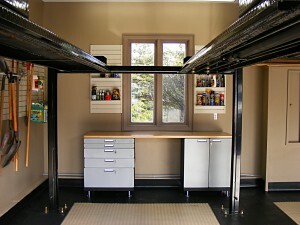 There are three aspects of the garage to take into consideration to figure out if a lift will work. The first is height. Depending on the vehicles, you’ll need ten to eleven feet of ceiling height. The second is width. There are several type of lifts available and some may be too wide for a narrow garage. The third is your automatic garage door opener. The majority of door openers have centre mechanisms that leave the garage doors a few feet from the ceiling. Removing this type of garage door opening mechanism, we replace it with one called a Jack Shaft Operator. 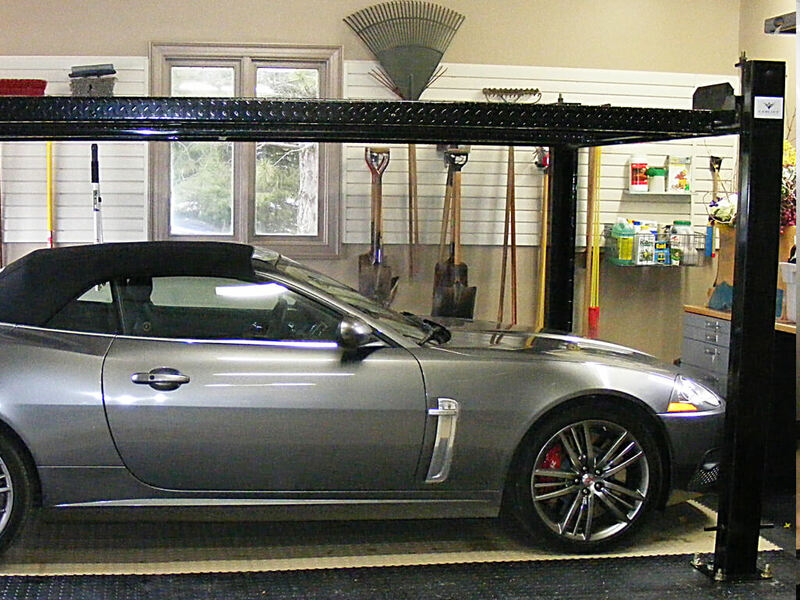 This allows the garage door to slide right up to the ceiling providing the clearance available to fit the car lift as well as the vehicles. There are four types of lifts – one post, two-post, four-post and scissor lifts. The one you choose depends on the space available, your budget and your purpose. We proudly install lifts from American Custom Lifts. 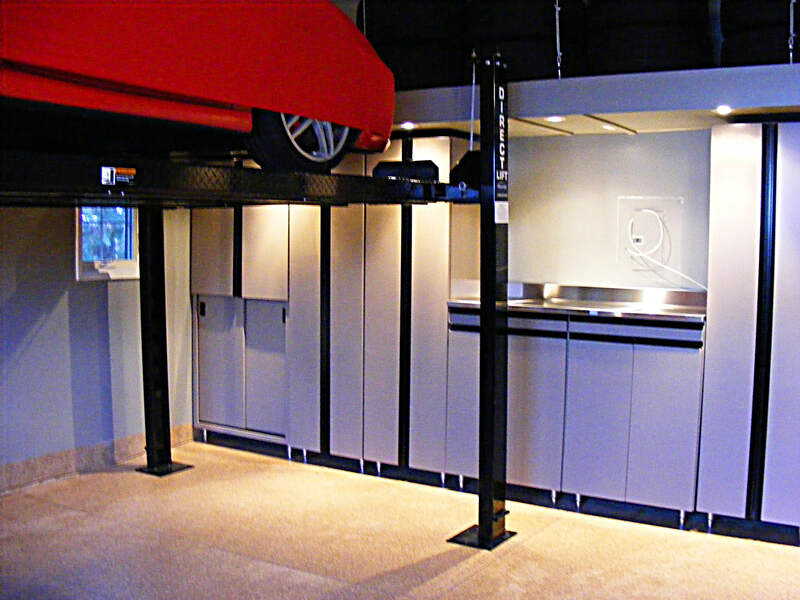 A one post lift is a good choice for a narrow garage because there are fewer posts taking up space. This choice presents the least barriers and can support up to 6500 pounds, which will accommodate even most SUVs, but it’s also the most expensive. Two-post and four-post lifts are good for heavier vehicles and one advantage is that the four-post lift costs approximately half of the one-post lift. They are simple to use and operate at the push of a button. The track of the lift widens and narrows to accommodate different vehicles of various sizes. All offer fully adjustable heights and locks that automatically engage when the lift is up. 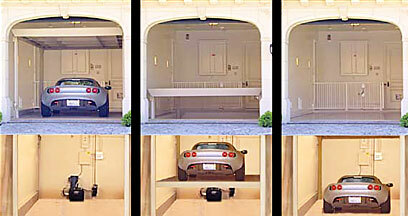 If you’re building a house from the ground up, one cool option is a subterranean parking lift. The deck structure and components are completely concealed below ground so there is no indication that a lift (or second car) is present when lowered. 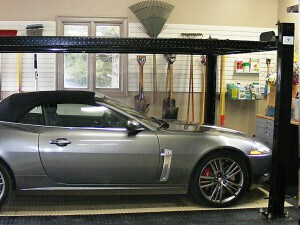 If your garage ceiling is high enough, you can access the lower vehicle without removing the upper vehicle! Car lifts are also a great option for people who want to work on their cars or set up a workspace underneath. 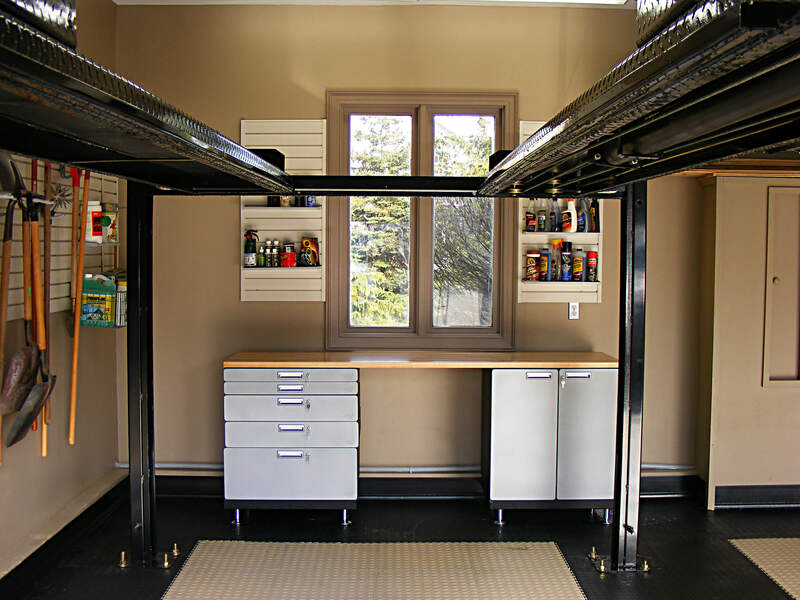 Where space is an issue, one of the custom options we offer is a workstation on wheels that fits neatly in a corner when you’re not using it, but can be moved into the middle of the garage when you need it.